US President Donald Trump has said he expects to reach a "very powerful" trade deal with Britain after it leaves the EU. He also hailed the "very special relationship" he had forged with Theresa May as the two leaders met for talks on the fringes of the G20 summit in Hamburg, which has seen violent protests outside. Mr Trump said he expected to reach a post-Brexit trade agreement with the UK "very, very quickly" and that it would be "great" for both countries. He said: "There is no country that could possibly be closer than our countries. "We have been working on a trade deal which will be a very, very big deal, a very powerful deal, great for both countries, and I think we will have that done very, very quickly." 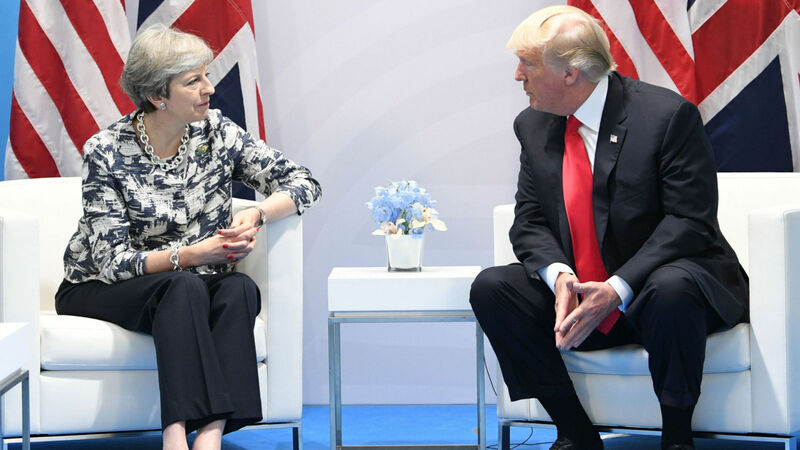 The President added: "Prime Minister May and I have developed a very special relationship and I think trade will be a very big factor between our two countries." Mr Trump also said he would "be going to London". Asked when, he replied: "We'll work that out." Downing Street said that "no date is being announced today".